Hector Moreno, Environmental Health and Safety Program Manager with the Green & Healthy Homes Initiative (GHHI), and MEA Program Manager Dean Fisher visit a home to verify completed weatherization work. For many Baltimore families, the home evaluations begin by word of mouth from friends and family. 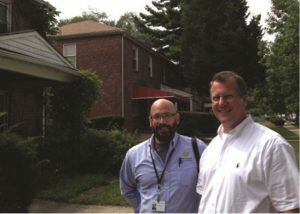 The Green & Healthy Homes Initiative (GHHI), formerly the Coalition to End Childhood Lead Poisoning, has been helping the city’s residents get help for sick children in unhealthy physical environments since 2008. When Karen Dukes heard about GHHI, she sought help with her family’s chronic problems of missed school and work due to her grandson’s asthma. GHHI was able to help Dukes and her family, as well as many other Baltimore households, with a $215,000 grant from the Maryland Energy Administration’s (MEA) 2015 Clean Energy Communities Low-to-Moderate Income (LMI) Grant Program that supports GHHI’s comprehensive strategy to improve health, economic and social outcomes along with home energy efﬁciency. The results of an inspection and energy audit in Dukes’ home revealed signiﬁcant health hazards, including lead paint and moisture that encouraged mold and pests, as well as areas of opportunity to reduce energy loss and water consumption, and to improve home comfort. As part of its 2015 intervention in the Dukes’ home, GHHI removed the lead paint hazards, ﬁlled holes that welcome pests, and performed extensive weatherization work to improve energy efﬁciency. One year later, the Dukes family is reaping the beneﬁts. The grandson has not missed a single day of school due to asthma triggers in his home, and Ms. Dukes has been able to attend work regularly to support the family. Additionally, the energy efﬁciency improvements have cut the family’s annual energy costs by almost 20%, and the family is living in a more comfortable, healthy home. MEA’s 2015 LMI grant to GHHI, its ﬁfth in as many years, made it possible for GHHI to assist another 55 families in Baltimore, the results of whose evaluations and assessments often revealed home hazards that adversely impact the residents’ health. 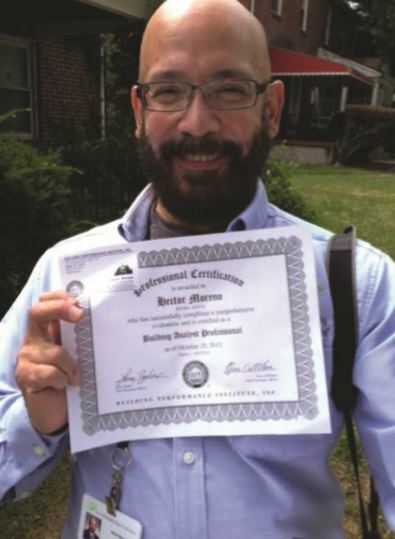 The grant award primarily enabled home energy efﬁciency upgrades in which a certiﬁed Building Performance Institute auditor analyzed the home using diagnostic tools to recommend cost-effective upgrades. 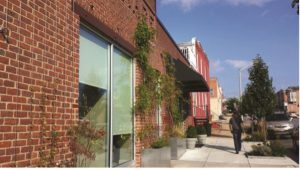 A holistic approach, in which both the health hazards and building envelope problems are addressed together, leverages the many advantages of weatherization work, which can improve the comfort and health of a home through insulation and moisture control—measures that also support improved energy efﬁciency and home durability. The LMI award provided for up to $1,000 per home to support health and safety improvements, such as repairing water damage and performing mold remediation, that enabled energy efﬁciency upgrades. The energy savings, the support of an asthma education specialist and the removal of health hazards that used to trigger asthma-induced hospital visits combine to maximize the beneﬁts of a GHHI intervention for the low and moderate income residents it serves. “The weatherization work made a huge impact on the energy efﬁciency and overall climate of my home during these summer months,” says resident Nikia Smith. Her remarks mirrored the sentiments of others who appreciated the many beneﬁts of the home improvements. For GHHI and the local economy, the beneﬁts included 4,713 labor hours under this 2015 award—local jobs serving local citizens. Hector Moreno, GHHI’s BPI-certiﬁed program manager.